Palas is a Piedmontese word meaning “Luxurious Palace”. Indeed the hotel is a true haven of peace, in the middle of world famous vineyards, ideal for relaxing and revitalizing stays. 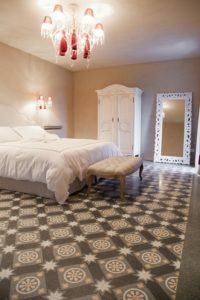 The rooms are in harmony with the general atmosphere of the place, well equipped and decorated with elegant furnishings. A swimming pool, a gastronomic restaurant and a charming terrace will ensure an unforgettable holiday. 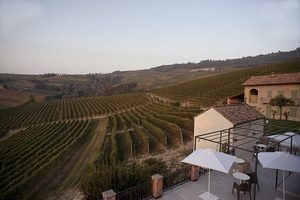 In the heart of the Barolo region, Palas Cerequio is marvellous place to stay. 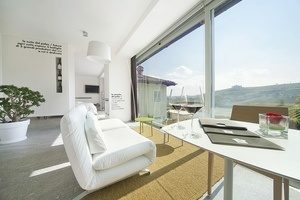 The hotel is surrounded by vineyards and ideally located in the picturesque village of La Morra which will give guests the opportunity to enjoy the Barolo countryside. Bra is only 30 minutes away and the great city of Turin can be reached in a bit more than an hour by car. 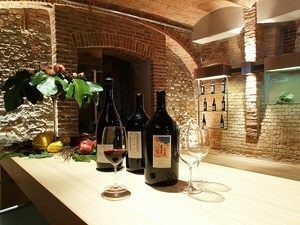 The wine is the main protagonist of the Palas Cerequio which is composed of a wine shop and a historical cellar. Other facilities include a stunning outdoor swimming pool and a breath-taking panoramic terrace. The restaurant of the Palas offers a wide range of delicious gastronomic dishes cooked with fresh local products. Cooking classes are also available on site. Ten suites are available in the Palas, including two junior suites and a VIP Suite. They are divided into two different themes, “the past” and “the future”. “The past” comprises of the Cerequio Suite, the Cannubi Suite, the Villero Junior Suite and the Rocche Junior Suite. These rooms are designed in a baroque style. The other suites, Rionda, Bussia, Arborina, Ginestra and Brunate are all part of “the future” and offer a minimalist relaxing atmosphere. Each room has individual climate control, Satellite TV, WI-FI, bathrobes, slippers and toiletries.